When teeth are discolored or malformed, there are often conscious efforts to avoid smiling or put a hand to cover the mouth or manipulation of the lips in an unnatural manner to make up for the defect with the help of laminates & veneers. A veneer is a thin layer of restorative material placed over a tooth surface, either to improve the aesthetics of a tooth, or to protect a damaged tooth surface. 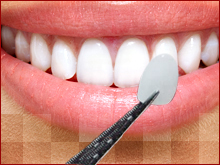 Laminate & veneers, are extremely versatile and can be used to align crowded or protruding teeth, lighten tooth colour, close gaps and can also be used as an alternative for orthodontic treatment. Because the veneer is so thin and contains no metal they have a translucent quality which means that they give a natural looking tooth, this natural look is also true under flourescent lighting and in flash photography.